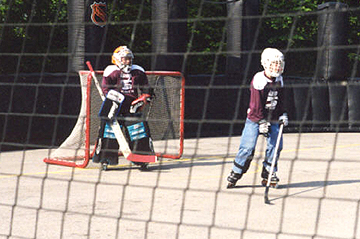 Hockey Breakout at Opryland: Stephen helps the goalie. A life orchestrated by God's hand - though unseen. "Why their son - only son - why not some other?" All understood by our Heavenly Father. "Be still my soul, and know that He is God." He is comfort - close to strengthen - "He is righteous in all His ways." He is Risen - no more crying - He's prepared a place for me. Raised in glory - eternally. See God's hand, though blurred by tears. Know Him - understand His might. Trust Him for alone He's faithful. "Walk by faith and not by sight." Trust God's Word - "Stephen's days were numbered." Thirteen years for Stephen - just right!